A simple dinner recipe with fresh Italian flavours. Bring water to the boil and cook rissoni pasta according to packet directions. Drain and cover until serving. Cook onion until softened, then add garlic and chilli and cook for a few minutes. Pour in wine and simmer until starts to reduce, about 2-5 minutes. Add cherry tomatoes and cook until they soften and release their juices, about 10 minutes. Add prawns and simmer until cooked through. Stir through chopped parsley, reserving some for garnish. 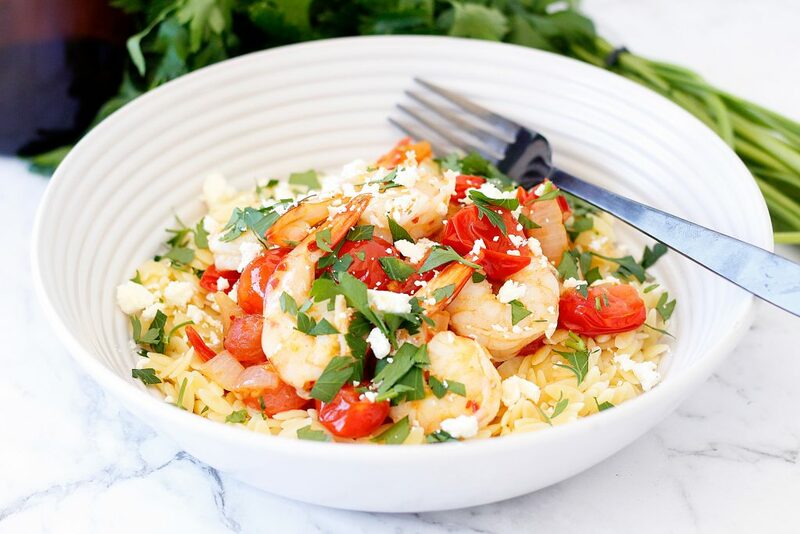 Remove from heat and sprinkle with crumbled feta and lemon juice. Serve prawns on a bed of rissoni pasta. White wine can be replaced with chicken or vegetable stock.